Our family just ventured out on a lovely road trip to New Hampshire. It was a much needed "vacation." (I put that in quotes, because if you have traveled with children, you know it is anything but a "vacation." Now that we are home, my husband and I want to know when our "real" vacation is!) 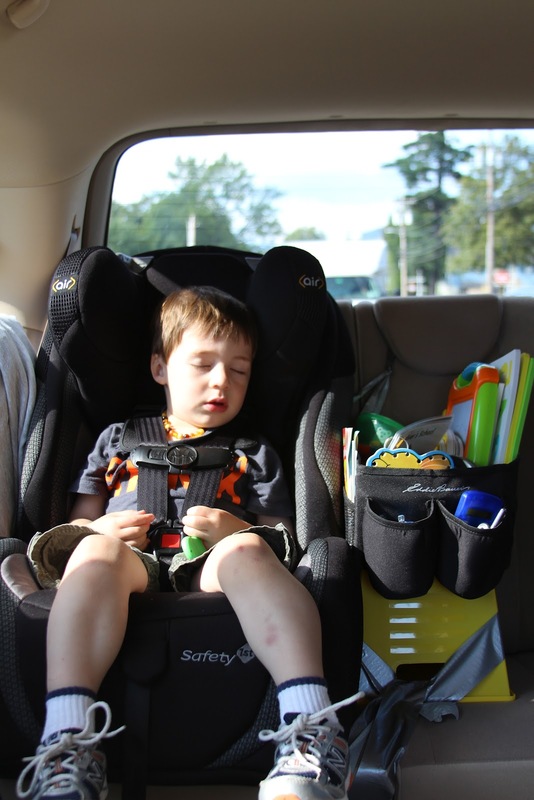 I was worried about the long drive - 5 hours - with an almost 3 year old toddler and 6 month old infant. I searched the internet for ideas and made a couple visits to the dollar store and craft store. Here is what I came up with - and it worked!!! 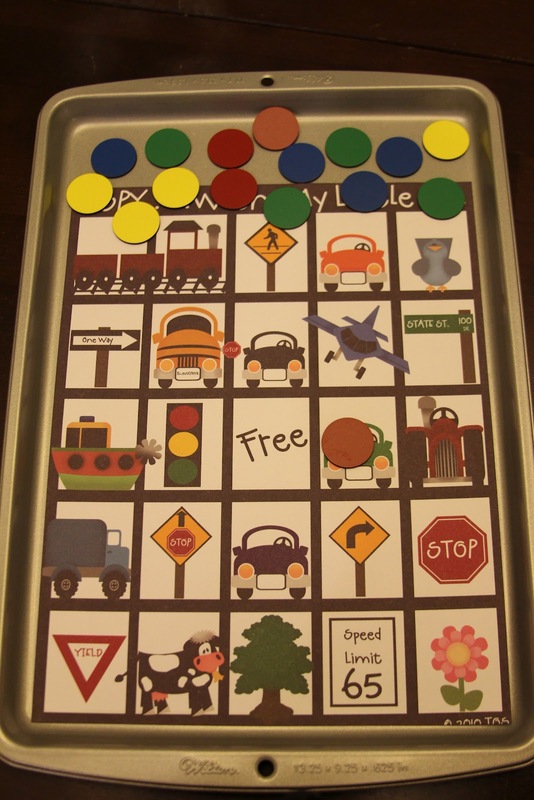 We always have a bin of activities in the car, so it was just a matter of adding new activities and changing things up a bit. I got a little more creative and brought along some more interactive goodies. Here is our bin - it sits between the carseats propped up on a box. We rented a minivan for the trip and I secured it to the van with duct tape! Worked wonders and only took a few minutes to get it all secure. Stickers... stickers... more stickers! (don't forget the pad of paper to put the stickers on - I've forgotten before and he ends up COVERED in stickers! ), and a couple books. If anyone knows where I got this bingo printable - I can't find my source (I am terrible at keeping track of these sorts of things.) I would love to give credit where credit is due. One of the best new additions to our bucket was a magnetic cookie sheet. 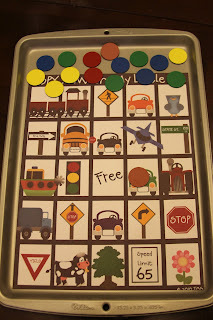 I used magnetic spice jars from Ikea and filled them with magnetic circles (see above with bingo) from Walmart, miniature cars from the dollar store, and a puzzle that I made with a page from this printable pack and magnetic strips. I also glued magnets to the bottom of a container we use for crayons. 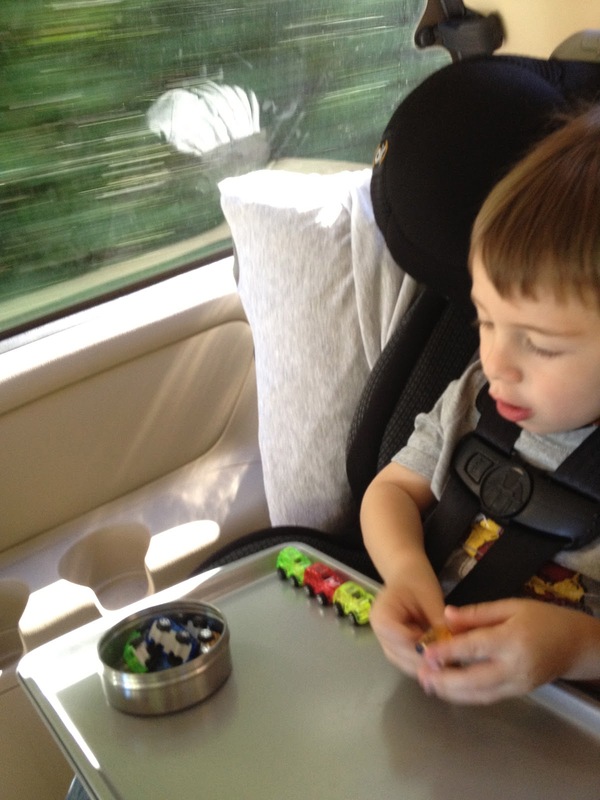 This allowed him to keep his crayons in place while using the tray as a desk. Below is a picture of Zayit playing with the puzzle/tray the day before we left. I thought it would be good for him to be familiar with some of the new toys before we were in the car. I find that the first time he is introduced to something, it generally doesn't go well or his attention span is less than 30 seconds. Zayit's all time favorite goodie in his bucket was a photo book that I made for him with pictures of his new school. He starts preschool this week and I thought it would help to familiarize him with his new surroundings. I plan to do a post of this book later this week. He loves his pictures of "my school." And of course... Ziva and her sensory bucket! This bucket has been so very handy. We fill it with all sorts of play things and let her go to town. We have a bucket upstairs and downstairs at home, and here she is at the hotel with her bucket! Best thing ever. All her toys are contained and she has access to whatever she wants. great ideas! we travel a lot so I always love new ideas! I have a list of 50 travel tips if you're interested! One of the top posts on my side bar. Thanks for sharing yours at The Sunday Showcase! Thanks so much! And thanks for sharing your travel tips. I'm always looking for good ideas - we do a lot of traveling and it's hard to be creative - new ideas are always welcome!